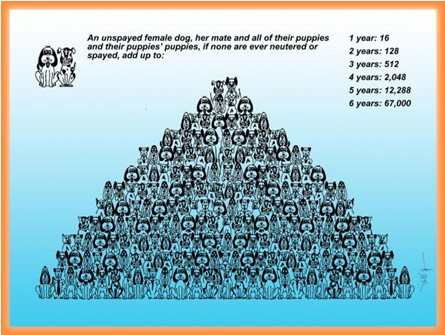 Why spay and neuter? Do it for the health of your cat or dog. Do it to control overpopulation. Spayed cats are less likely to develop breast cancer and will not be at risk for ovarian or uterine cancer, while neutered males will not get testicular cancer. By neutering male cats, you also reduce the risk of injury and infection, since intact males have a natural instinct to fight with other cats. Spaying also means female cats do not go into heat. That means they attract fewer tom cats to the area, reducing fighting. The average life span of a feral cat outdoors is approximately 18 months. 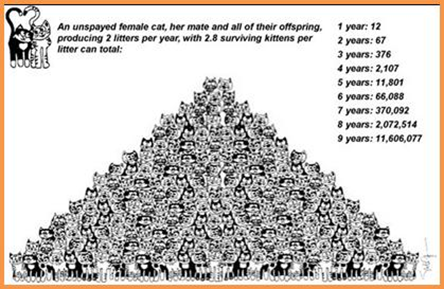 If cats are sterilized and live in a colony that has a caretaker, they may live more than 10 years. Neutered male dogs live 18% longer than un-neutered male dogs and spayed female dogs live 23% longer than unspayed female dogs, according to the report. Take a look at the pyramid charts below! Beginning as early as five months of age, each cat and kitten can go into heat every 14-21 days. Once pregnant, the gestation period is 56-65 days. They can have 2 – 4 litters per year. You can see that the numbers of potential kittens born grows exponentially. Trap-Neuter-Return, commonly referred to as “TNR,” is the only method proven to be humane and effective at controlling feral cat population growth. Using this technique, all the feral cats in a colony are trapped, neutered and then returned to their territory where caretakers provide them with regular food and shelter. Young kittens who can still be socialized, as well as friendly adults, are placed in foster care and eventually adopted out to good homes. PLEASE CONSIDER TAKING THE TNR WORKSHOP OFFERED BY NEIGHBORHOOD CATS! It’s just one 3.5 hour class. The classes are offered in every borough. You will learn how to care for the feral and stray cats in your community and make use of the many resources now available to assist you. All workshop attendees will become TNR certified and NYC residents will gain access to low cost spay/neuter (currently $5 per cat at the ASPCA’s clinic), free traps and equipment, and expert guidance and assistance. Please explore the entire neighborhood cats website… as they have information on virtually every aspect of TNR. https://www.neighborhoodcats.org/. Hobo was hit by a car and found laying on the side of the road. His arm was mangled. With a rod surgically implanted, he now runs around like a rambunctious toddler. We don’t know how Simon survived 28 days being sealed up in the house where his owner suddenly passed away. Looking frightened and confused, this photo was taken during his medical exam on the day we gained entry to the house. Simon regained his health and now lives happily with his new family. “Love” was in terrible pain and could barely walk when he was rescued from a swamp area of Howard Beach, Queens. He was diagnosed with a longstanding broken and badly infected paw. Our veterinarians provided outstanding care and he has completely healed. Blind and feral and somehow surviving on the street, Becky’s eyes literally exploded from untreated eye infections. The pain must have been excruciating. Her eyes had to be surgically removed. This is Becky now relaxing in her amazing forever home. She runs and plays as though she has eyes. A hoarder was evicted and 65 cats needed placement fast. Our amazing animal hospital allowed us to bring in 22 feral cats on one day for vaccines, examinations and dental procedures. Your financial help made these rescues possible. Do you know anyone who may be willing to adopt our supposedly unadoptables and our very adoptables?